2) they should be about the bride and/or groom. Many wedding speechmakers tend to bypass the bride and groom and head right into more familiar territory: their own experiences. Not only is the resulting speech dull, it’s also highly inappropriate. Though you absolutely may interject something of your relationship to the bride and/or groom into your talk, be sure it’s only a segue to discussing the newly joined couple. Many novice speech writers forget that would-be humour can quickly go awry. What seems amusing in one situation is not particularly comedic in another. Consequently, add only very light, non-offensive humourous touches to your speech lest you offend anyone in your audience. Alcohol may flow freely at most wedding celebrations, but if you’re expected to make a speech, it’s essential that you curb your intake of potent libations pre-talk. Otherwise, you could wind up with a major case of “morning after guilt” the next day. Often, friends and relatives will bring up prior marriages or relationships during wedding speeches under the guise of being “witty” or familiar; however, such comments are typically met with disgust, tears, and/or hurt feelings. Never mention the bride’s or groom’s former spouse or significant other when giving a wedding speech. Even if it’s tempting to use the subject, rest assured that it will only cause awkwardness. 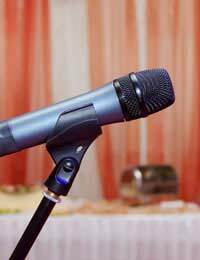 You may have a great deal to say, but as a wedding speech maker, it behoves you to pick only one or two topics for the sake of yourself and your listeners. After all, the audience doesn’t want a lecture; instead, they want to hear you speak about the bride and groom in a positive, pithy way. By being pragmatic and thoughtful, you can ensure that everyone recalls you as a perfect wedding speech maker whose talk resulted in genuine delight rather than “thank goodness it’s over” applause.